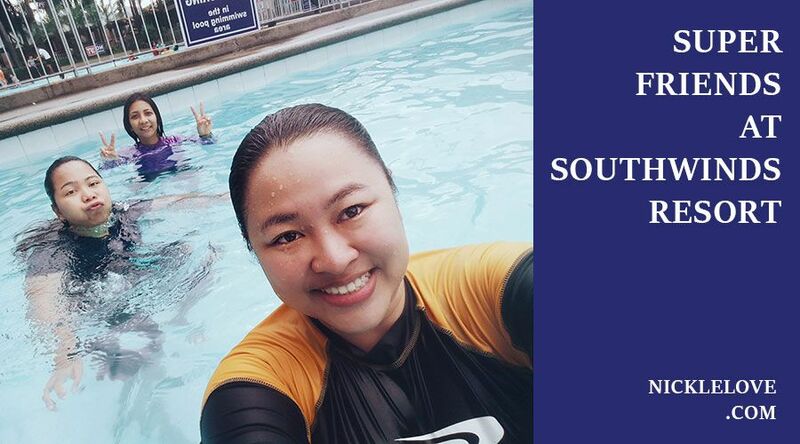 During the first week of March, I had the sudden urge to go out of town so I sent a message to one of my closest friends and asked her to plan an outing, something cheap, as long as we get to swim. After she came back with a place to go to, I asked for the availability of our other friends. Unfortunately, most of them were not available for the weekend so it was only 3 of us who went. We met at South Station at around 8 pm on a Saturday. We took a bus to Calamba and got off a street where we took a tricycle to get to Southwinds. I was surprised at how beautiful and clean the place was. There were a lot of people waiting to get inside. The entrance fee was affordable, they also offer tables, cottages, electric fan rooms, and air condition rooms. We were aiming for an electric fan room so we would have a place to keep our things while we enjoy our swim. Sadly the only room left was an air conditioned room with a jacuzzi which costs around 2k. I didn’t want to worry about our bags so I had to shell out extra money to get us a room. Southwinds Resort is beautiful and clean and has 5 pools. 2 kiddie pool, a 3ft, 4ft, and 5 ft pools with warm natural spring water. Our room was big enough with an even more impressive bathroom. We were ignorant fools for a moment and took a bunch of photos inside the jacuzzi. LOL. We had so much fun enjoying the warm water and switching between the 4 and 5ft pools. Since it was night time, we didn’t take any photos and just enjoyed each other’s company. After feeling tired and hungry around 12 mn, we decided to go back to our rooms and eat the bread and peanut butter I brought with me. The next morning we went out to find food. We saw and bought from the taho vendor, then went to the convenient store for breakfast. Having a few hours before we had to pack up, we went back swimming again. This time my friends brought their phones so we can take pictures while we enjoy the little time we had left. Two hours before check-out, we asked one of the staff to fill up the jacuzzi so we could use it since it was paid for. Here’s the thing you won’t be able to fill up the jacuzzi with water. They are the only ones who can control it, which is good but a little inconvenient. First, we had to wait for them to confirm our package which I couldn’t understand because you can’t book the room and not pay for the jacuzzi – it’s a packaged deal – and yet I was asked to present our receipt twice. Second, the water was too hot and I couldn’t add cold water to even out the temperature. I guess I would have had to call the staff again. All in all, it was a great experience and we were very satisfied with the pool and service. When I woke up on a Sunday morning, I found out they emptied the 4ft pool for cleaning. They were scrubbing the tiles and going through the whole pool to make sure it was clean. I’m a little disappointed with the food options though. There was no lugaw available and we were looking forward to it! LOL.